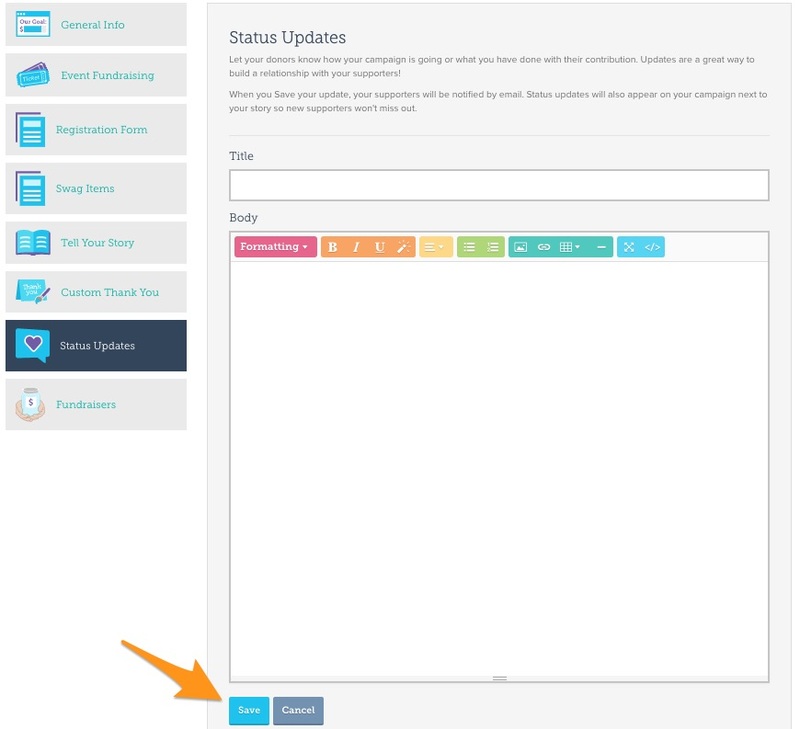 Navigate to the "General Info" tab to confirm all the information you entered when you created your Event (Title, Goal, Dates, etc.). This is also where you can establish some settings specific to your potential donors who might not want to register. This is where you can opt in to collect your donors' address and phone numbers. GiveGab defaults to not collecting that information, as we find that the simplest donation forms are most effective with online donors. 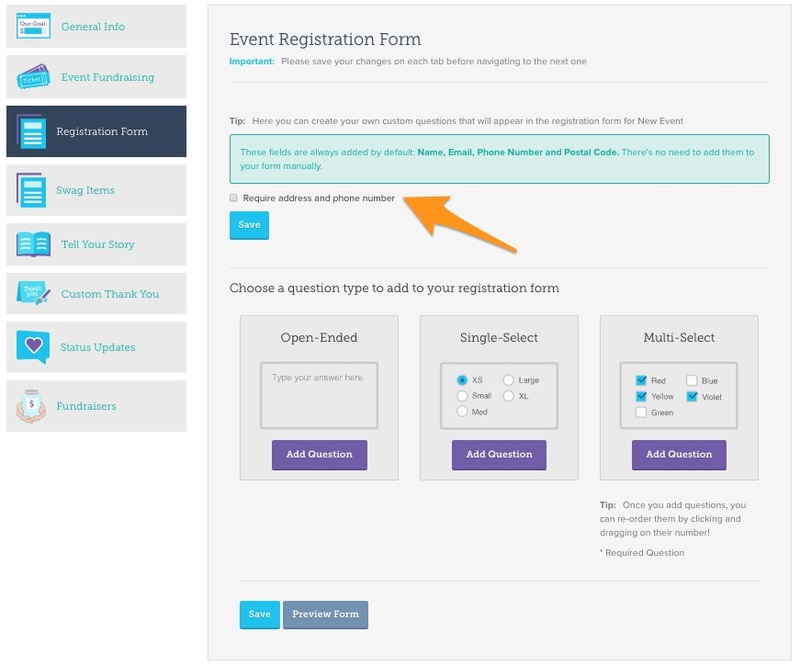 The "Event Fundraising" section will help you manage the main components and logistics for the registration process. Here you'll set the event dates, control whether you need to close registration, add additional registration types, include discount codes, and upload important documents like a waiver! 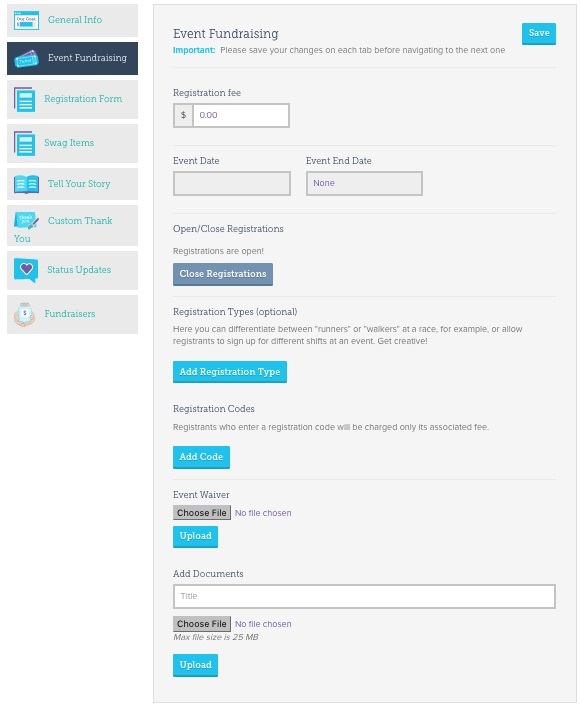 The "Registration Form" tab will help you collect crucial data on your registrants while they sign up. If you need to collect address and phone numbers for your registrants (remember you selected your donor settings already) - make sure you check the box that says "Require address and phone number" to make sure they provide that information. After that, you'll tailor the form completely to your needs. For instance, you can ask if your registrants require specific accommodations, whether they have dietary restrictions, or require registrants to agree to specific terms for your event. Here's your opportunity to sell merchandise during the registration process! While T-shirts are often the most common merchandise option to sell, the "Swag Items" section allows you the flexibility to sell other items that will further your branding and mission. From bandanas and water bottles, to T-shirt upgrades and VIP goodies. Merchandise purchases are listed on their registration receipt, and you can pull a report on their purchases later. 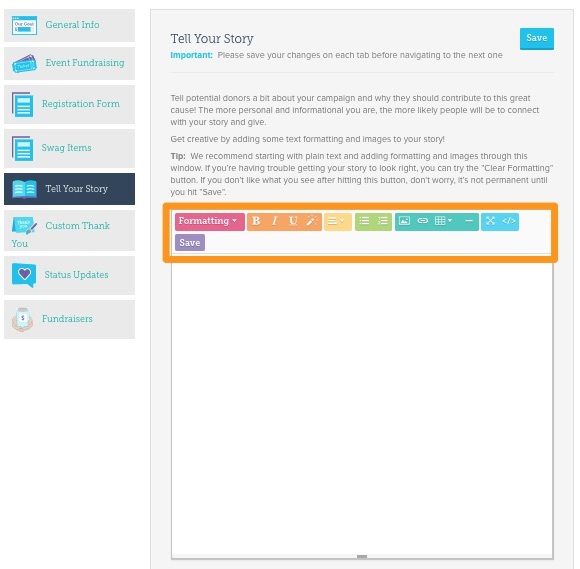 After entering the basic information for your campaign, you’ll land on the “Tell Your Story” tab of the Campaign Editor. This section is the heart and soul of your campaign page. 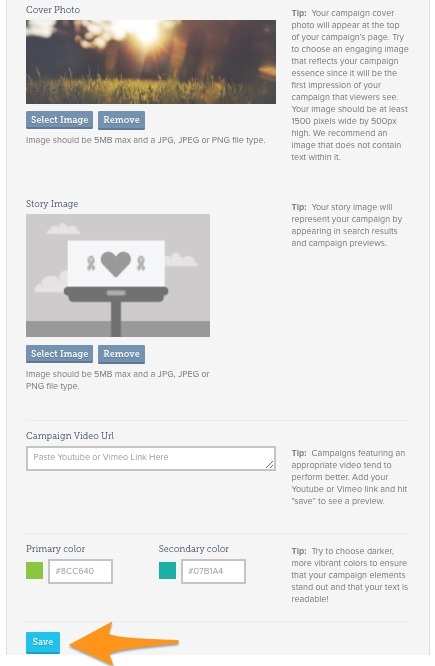 Within this tab you can craft a compelling story using our campaign story editor, add a cover photo, your story photo (often the event's logo), and a video related to either your organization or your campaign. Make sure videos are high-resolution for the best quality! At the very bottom, you'll have the option to customize the colors of your campaign. You can even enter hex codes to match your Fundraising Event page exactly to your organization's branding. Keep in mind that you can’t set your Event to "Live" until you add a story, cover photo, and story image. Your donors and registrants will automatically receive an electronic Thank You message that will come from your designated organization contact. This email also includes their tax-deductible receipt! To ensure that email is more personalized, add a custom Thank You message - you can even customize one for donors and one for registrants to tailor it to your supporters as much as possible! You also have the ability to add a video or thank you image. Gratitude is one of the first steps in successful donor stewardship, and this opportunity will go a long way in delighting your supporters! Keep your donors and registrants in-the-know with your progress, milestones and important news using the "Status Updates" tab! These customized updates will be sent to your supporters, as well as posted right on the event page. It's another simple and creative way to engage your supporters before, during, and after your event. 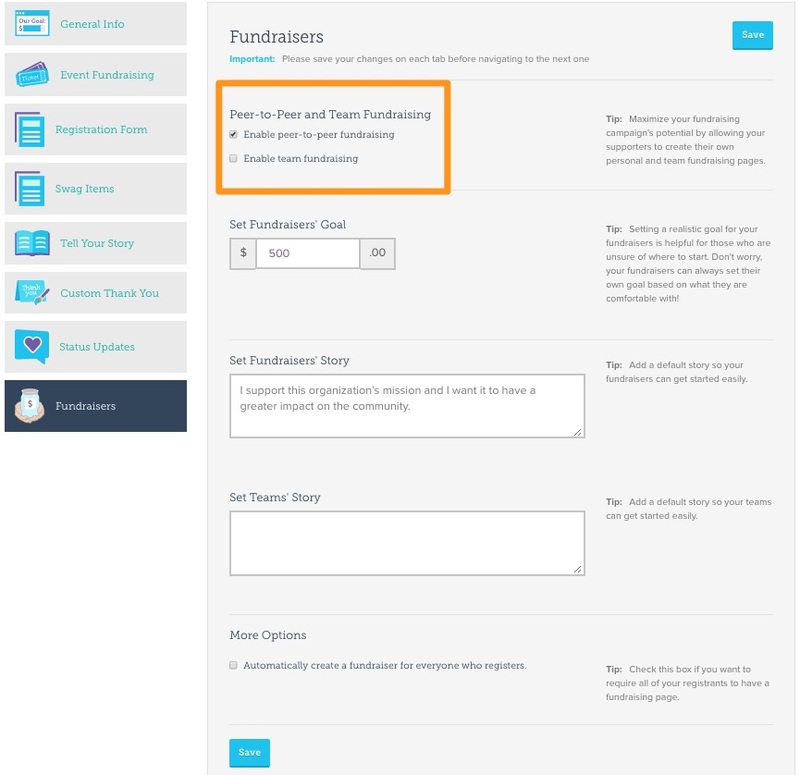 Last but not least, if your event has Peer-to-Peer Fundraisers or teams, the "Fundraisers" tab is where you create the default settings for those pages. After deciding which fundraising capabilities to enable, you can adjust your future fundraisers' goals, set their automatic stories, and, if you have team fundraising, set the automatic story for potential teams. We suggest creating your own content in these fields. That way, if your fundraisers decide not to customize their page, the default content grabs the attention of potential supporters all on its own. 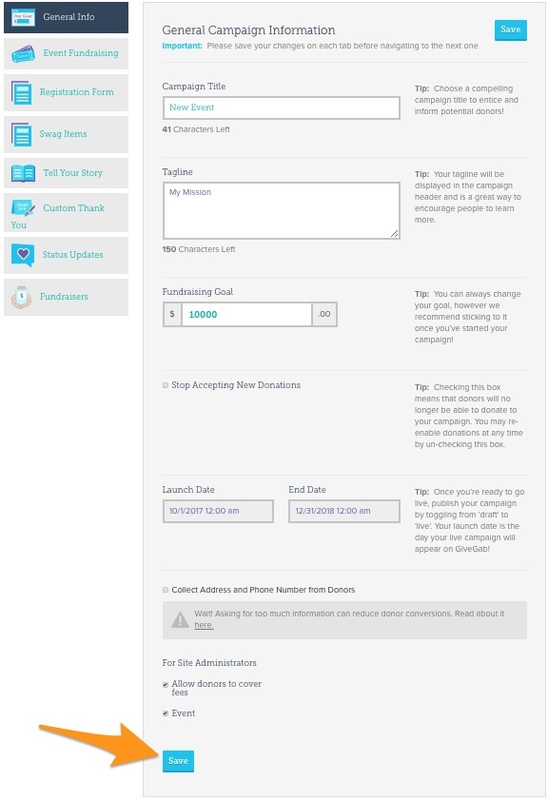 These customizations are still fully adjustable by the fundraisers within their individual Fundraising Toolkits. 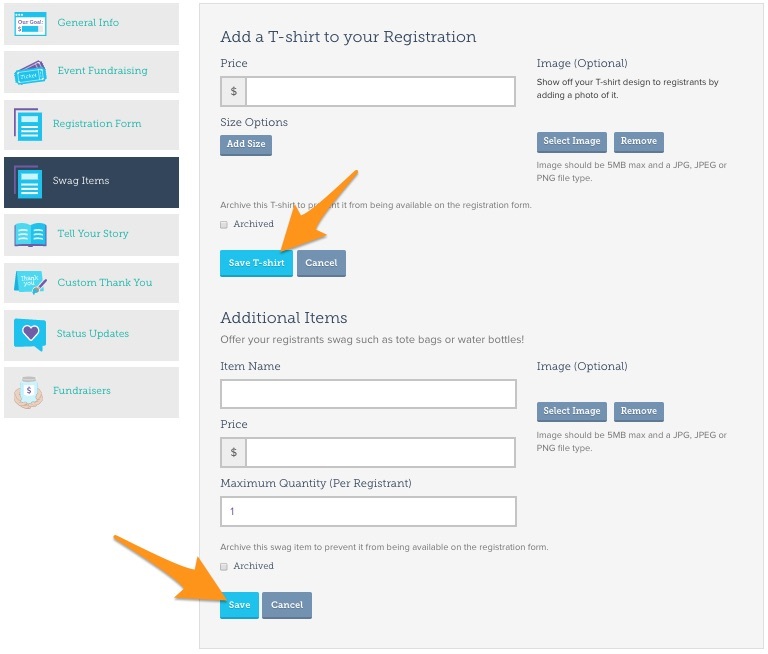 If you want every registrant to automatically have a Fundraising page so they don't have to manually opt in, make sure you select that last checkbox under "More Options" before selecting save! Once you've covered each section, your Fundraising Event will be ready to launch to "Live"!